From the shadow comes the light! For darkness to be healed, it must be brought to the surface, examined, and replaced with something new! We are living in a time when we don’t know who to trust or what to believe. There are leaks and lies, fake news and fraud, identity theft and phony facades. There is no denying that something is broken…and as a result anxiety, anger, desperation, mistrust, hopelessness and fear are at an all-time high! It’s no wonder we want to escape. To find ways to tune out, zone out, or numb out. But what if this massive breakdown is the prelude to a global breakthrough? What if there was actually something really simple, yet powerful, each of us could do to start creating a better world for ourselves and future generations? For things to change we need to break free from the trance of denial and get real about what is and isn’t working. Turning a blind eye to our patterns of self-destruction or blindly putting our faith in what was or the way we think things should be is only perpetuating the reality we don’t want. We need to let go of our outdated and dysfunctional beliefs, behaviors, structures, and systems. And we need to begin with ourselves. WE ARE EACH BEING CALLED TO MAKE A CHOICE. We can either cling to the outdated values and ways of being of the past or adopt new ones. We can continue to stay asleep, judge, blame, or be haters or step up to the plate as conscious co-creators! After we clean out what is not working, if we don’t consciously fill the space with something new, then the past will automatically be carried forward and we will have more of the same. To create a new reality we must pledge to mindfully replace the structures, systems, and ways of being and operating which are incongruent with the good of the collective with those that are rich in harmony with the earth, serve the good of the whole, and are aligned with core values of honesty, unity, inclusion, wholeness, authenticity, and love! INTEGRITY is a word that we hear a lot about these days. It’s referred to as a sort of moral code that people adhere to or not or a character trait that people display or do not. But here’s the thing. Integrity is not just a quality. It is the essence of who you are. It’s not something that you have to get. INtegrity is INside of you. It’s your truest self, the truth of who are. And while being lied to by colleagues, friends, or politicians is infuriating, lying to ourselves is much more destructive. It tears us apart and whittles away at our self-worth and self-esteem. Yet, we do it every day! We play small, step over our truth, quiet our voice, negate our needs, deny our desires, and look to others for our answers. The mistrust we have in others is a projection of the mistrust we have in ourselves. Now is the time to wake up and truly honor ourselves on a cellular level. So, are you ready to wake up? To step up? To clean out the discord, deceit, and destruction? 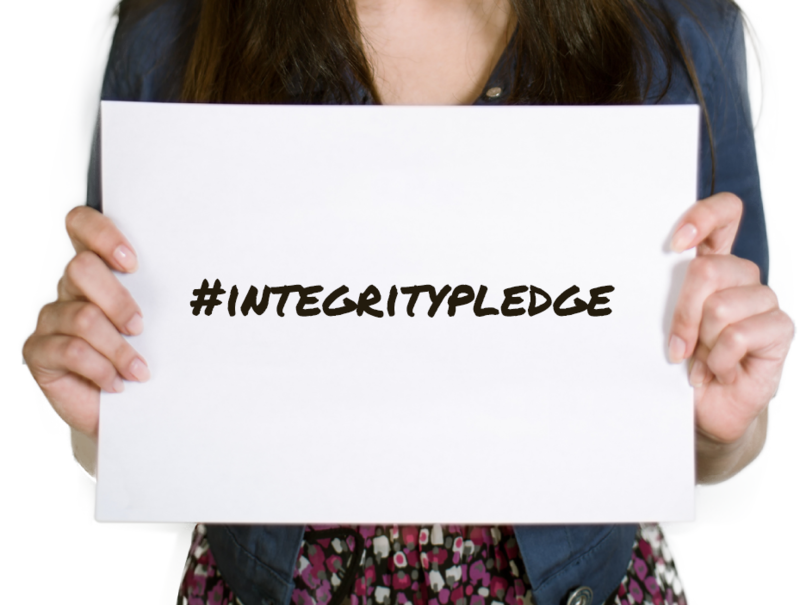 And to pledge integrity? NOW IS THE TIME. IT’S YOUR TIME.